When we think about landscape lighting, we often think about the light. After all, it’s right there in the name. But there are many ways to create dramatic effects. Some aspects of outdoor lighting are, by necessity, all about light. We spend a lot of time in this blog talking about how to use lighting for security, to make spaces usable at night, and to highlight your favorite features. All of these are important uses of light. But another important and often overlooked function of light is to create shadows. Using shadows is one of the most critical parts of outdoor landscape lighting. Without light, there is no shadow. But without shadows, it may as well just be daytime. If you want to get a truly stunning outdoor lighting system, you need to consider how you use shadows. Light is important. We get it. You want to be able to see your house from the street. You want to be able to walk from your car to your entryway without tripping on every step and pebble along the way. It’s important to light up your outdoor living spaces so that you can use them at night. These are all wonderful uses of light. But now let’s talk about applications for shadow. Shadow is the forgotten sibling of light. Unless you want to shine huge spotlights on your entire property or put up ballpark-style stadium lights, there will be shadows. You can’t avoid them. And you don’t want to. So, since shadows are unavoidable, the real trick is to incorporate those shadows into your design. 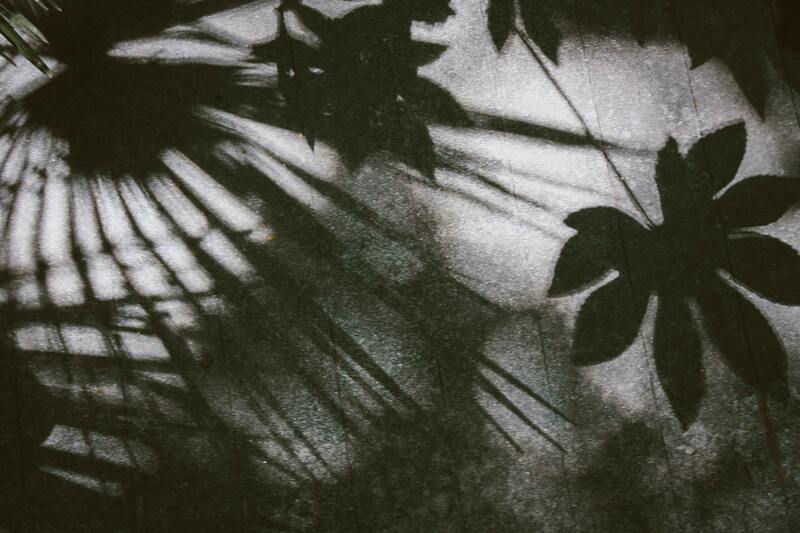 Shadows can be used in many ways to complement and contrast the light you shine with your outdoor fixtures. Together, the light and shadow can create dramatic effects that were not present in daylight. This is one area where experience and expertise make a huge difference. Pointing some lights is one thing, but keeping in mind the shadows and maximizing their potential is another. Shadows are an art, and experience makes a huge difference. When you work with Night Vision Outdoor Lighting, you get the benefit of over 20 years and thousands of lighting projects worth of experience. That’s hard to find anywhere else. Hardscaping is any part of your outdoor property that is not alive. Common types of hardscaping include stone walls, fireplaces, stairs, walkways, paved areas, and even driveways. Pergolas, water features, and any other landscape features made up of hard-wearing materials such as wood, stone, concrete, etc. are also considered hardscaping. In some situations, you really do want to reduce shadows as much as possible. This is most true for areas where you want to be able to navigate or spend time. For instance, a driveway or walkway might require lighting with almost no shadows. But even areas where you plan to spend time, such as a pergola, can use shadow to their advantage. For large structures, like pergolas, consider using directed downlighting to create a geometric shadow on the ground. Depending on the design of the pergola, you may get all different patterns on the ground. Consider how you can use shadow patterns to enhance your design, rather than eliminating them. An excellent use of shadow is highlighting texture on walls, fireplaces, and other textured surfaces. The technical name for this technique is grazing. Light is shined upward or downward nearly parallel to the wall. The light at this angle creates a sharp contrast between light and dark areas based on the texture of the surface. It highlights ridges and puts deep shadow above or beneath them, depending on the source of the light. Another way that shadows can be used for dramatic effect is to intentionally cast shadows on a background. Of course, to make this work, you need a suitable background. Often, the side of a house or a large wall is perfect. This technique, fittingly called shadowing, creates a silhouette on your background wall. Shadowing is often used with trees or even sculptures that have an interesting profile. A bright light, such as a bullet light or small spotlight, is pointed directly at the feature to be shadowed, on the opposite side from the background. This creates a crisp shadow on the background. The shape is determined by the profile of the feature you are lighting. This is a beautiful technique to use with trees because the shifting leaves and swaying branches can add the additional characteristic of motion to their shadow. It is crucial when using the shadowing method that other lights are not placed between the feature being shadowed and the background wall. The light on the background wall should come from in front of the feature. Any lighting behind the feature would wash out or eliminate the shadow. During the day or on a bright moonlit night, you may notice a beautiful pattern of light and shadow as light from the sky passes through leaves and branches. In fact, a large part of feeling like you are in a natural setting is the presence of these natural shadows. At night, of course, those shadows are gone. But a little creative lighting can bring them back. The primary method for creating the dappled effect of natural light streaming through your trees is to use downlighting. The downlighting needs to be placed very high up, either in or above your trees. As the downlighting is obscured by the trees, it creates a natural pattern of shadows. You can use a warm, somewhat bright light to recreate daylight. However, another common technique is to use cooler, dimmer lighting to replicate moonlight. After all, the goal of outdoor landscape lighting is not to recreate the day, but to light up the night. Artificial moonlight is a great way to do that. 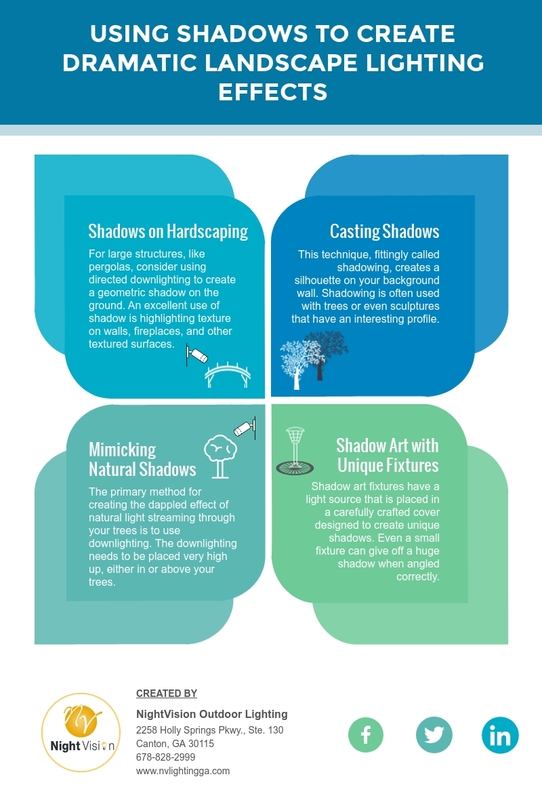 You can use the various features of your landscape to create many dramatic effects of light and shadow. But you can also introduce new features specifically designed to create shadow art. While most fixtures are designed to direct light at an object or area, shadow art fixtures are a bit different. Shadow art fixtures have a light source that is placed in a carefully crafted cover designed to create unique shadows. Even a small fixture can give off a huge shadow when angled correctly. Bollard lights are a great way of introducing shadow art. By placing a light source inside of a bollard, then covering the bollard in an appropriately shaped or carved cover, you can give off giant shadows across the ground. Another technique is to use downlighting with a carved out cover that creates a pattern or image on the ground. Making your shadows count is an excellent bonus of outdoor lighting. But it can be hard to envision and plan for without a good deal of experience. One way to try some things out is to use a bright flashlight at night. However, really planning out all of your lighting while keeping shadows in mind can be tough. That’s where a little professional help comes in. Night Vision Outdoor Lighting looks at your outdoor lighting project as a complete unit, including both the lights we install and the shadows they create. Contact us today for your free estimate.